Thin Engagement Rings or Thick Engagement Rings: What Looks Best? Engagement rings width: what’s the best choice for you? When you’re choosing engagement ring designs for your hand, think about what makes you look good, not just what is in fashion. As a thirty six year jewelry designer, I’ve designed for all ages and thinness’s and thicknesses of hands. 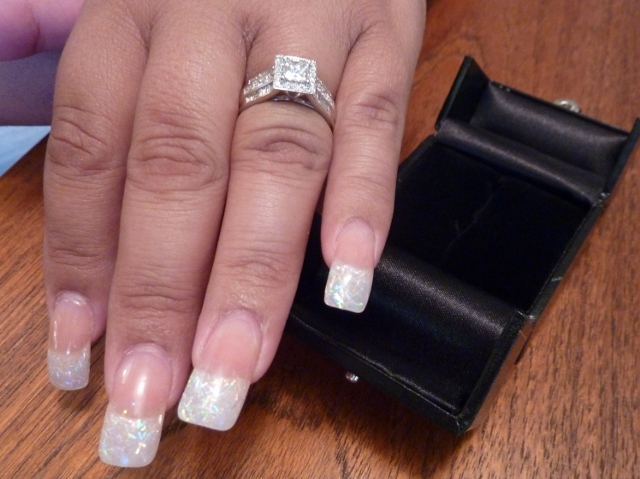 It’s always fun to help a bride-to-be get that ring that shows her beauty. Not every bride is 20, and this post talks about what to look for in engagement rings, and what design helps to make your hand look its best, regardless of your age. 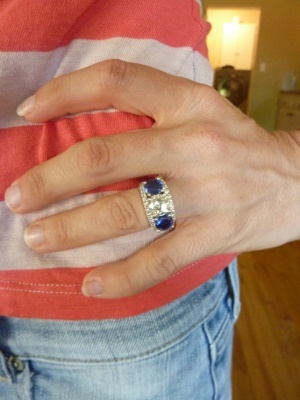 A Medium to Thin Engagement Ring with Three Perfect Gems at the Center Set’s off Laura’s Youthful Hand. Thinner rings work for young women because it shows off their clear, youthful skin. A thin ring highlights the feminine beauty of the young. The smooth, shiny surface of the ring quietly sets off the blemish-free skin of a young person. This concept is similar to wearing clothing. Young people can wear tighter fitting clothes, revealing more skin. When you have perfect skin, thin and delicate shows off that perfection. Vanessa Just Renewed Her Vows. She Changed up Her Thinner Ring for This Wider Style. Awesome! Wider rings often work better for mature women. I speak from experience when I say that our hands begin showing more “personality” as we age. Where a thin delicate shank shows off the skin, a wider shank doesn’t. The extra width in a ring calls away attention from freckles, blemishes, and sun-damaged skin. A wider ring makes your hand look prettier. If you dislike some aspect of your skin, the shape of your hand or fingers, or just feel you don’t want to call attention to your hands, the last thing you want to do is go tiny. Or worse, not wear jewelry. What works like magic is to wear bigger pieces that call attention to themselves—and not your skin. And a wider shank for your ring does this beautifully. Have You Outgrown Your Wedding Ring? That little, dainty wedding ring that looked fabulous on you when you were twenty-two may need updating today. 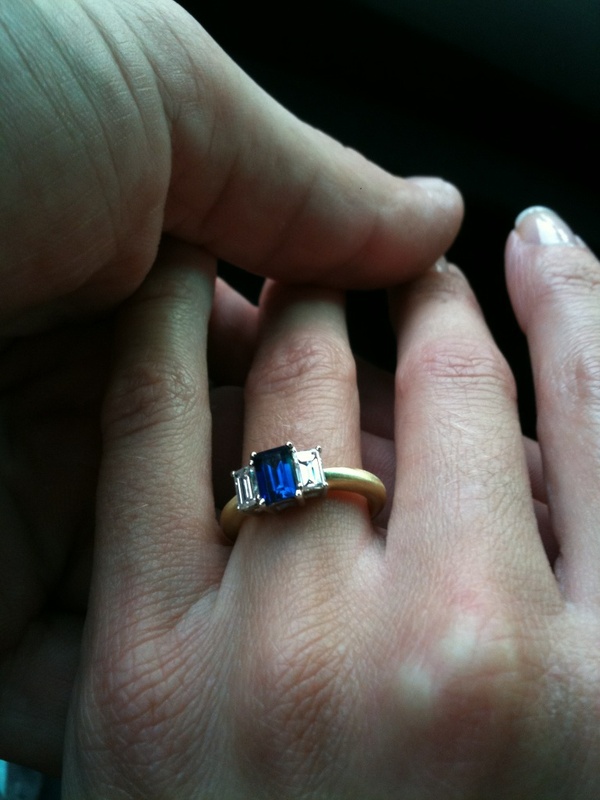 After three kids, twenty years, thirty pounds, and saying “I do,” you might consider “enlarging” your wedding ring. Oftentimes, women replace smaller center diamonds with something larger and bolder. Other times, I make whole new bolder and wider designed rings from the ground up for women. 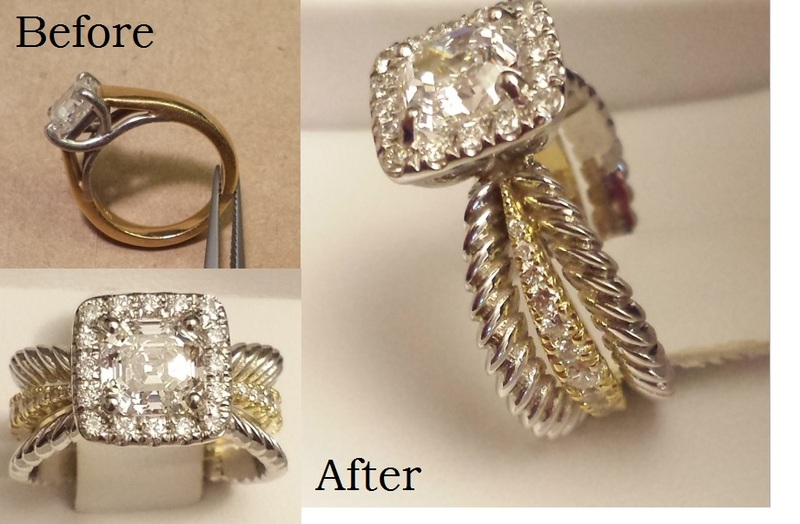 Sometimes we incorporate the old ring and its side gemstones; sometimes we don’t. 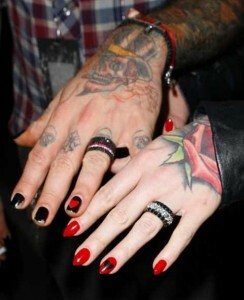 When You Have Tats on Your Hands Go For a Wide Band Wedding Ring Look to Stand Up to Them. The jewelry you wear is integrally linked to other people’s perception of you. A bold, beautiful ring automatically makes you and your hands look better. A ring with the proper width, color, and texture, along with good gemstones and design elements, will compliment you and your hand. Regardless of any skin discoloration or “issues” your hands may have. I call this, ‘the overall impression of beauty.’ The impact that wearing that ring makes, is beautiful. However if you’re wearing a ring that is out of balance with your hand, then you lose that beautiful impression and you’re just wearing a ring. For wedding rings—and most others for that matter—thinner and smaller is better for younger. Wider and higher or with curves is better for the more mature. Just show this blog post to your husband if you’re getting any static about that diamond upgrade! May your ring be the right one for you. 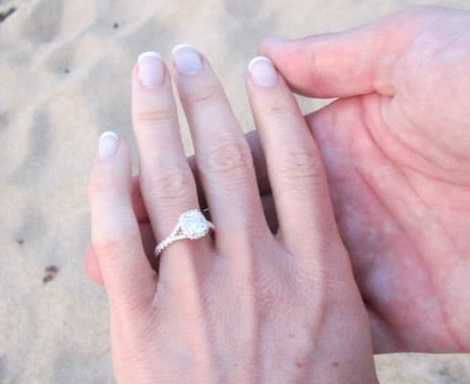 Love the statement about outgrowing your ring! My original engagement ring was very dainty, but my current new ring (designed by Calla) was definitely an enlargement, bigger and bolder! I loved this article. Calla, It’s so true the right width-size for your ring for your hands/fingers is very important. I have more “mature hands” as you would so diplomatically say Calla and I noticed that I’m wearing all my wider band rings. I feel good in them. I went to my jewelry box and tried on two rings I rarely wear. Surprise surprise! They have thin shanks and they really don’t make my hands look good. I’m so glad to know what the deal is. With the knowledge you have imparted here it tells me that Calla Gold can create the perfect ring for anyone. What an interesting article, Calla! I had never thought about the design of rings needing to change as we get older. It makes good sense, though. Thank you, as always, for educating, and therefore empowering, us! The pictures of the hands with the rings is really helpful. I can see that the wider band shanks do make an older hand look better. I think we do the knee-jerk choosing of what’s in style and sometimes forget to ask if it complements our hand. This is such good advice. I’m forwarding this link to my aunt who is getting remarried.